At Beverly Dental Center, we’re happy to share the various health and cosmetic benefits of orthodontic treatment directly with our patients instead of having to refer them to outside offices. The added convenience makes it easy for the whole family to achieve straighter, healthier smiles! Plus, we provide dedicated options for children, teenagers, and adults in one location. If you’re interested in scheduling a consultation for yourself or your loved one, contact us in Carrollton, TX today. What Orthodontic Services Do You Offer? 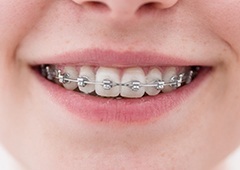 Traditional metal braces for all ages, which use brackets, wires, and elastics to shift teeth into the desired positions. Clear/ceramic braces for a more aesthetically appealing treatment process that helps patients maintain a stronger sense of self-confidence. Phase 1 treatment for young children who are not quite ready for full orthodontic care but will require it in the future.